A new blog is a new beginning, so I'm sharing the beginning of my story with design. It actually begins when I was little, watching my mom attend school to become an interior designer. I played around with her mat boards and fabric swatches and she taught me to sew. In middle school I spent all my free time using 3D Home Architect on the computer in our kitchen, drawing out floor plans. (Almost all my houses had secret rooms, because duh they're awesome, and also I was 11.) I didn't realize I'd have such a love for a career in interiors until after college, when I attended a summer intensive study at Parsons for Interior Design. 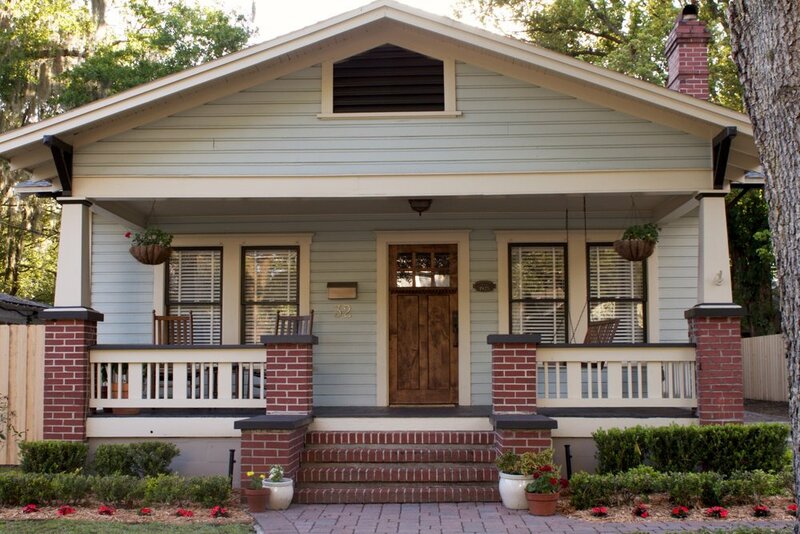 The first big project I completed was our 1925 Crafstman bungalow in downtown Orlando, Florida in 2009. My husband and I had been married a few years, and I was completely hooked on design blogs. There were so few at the time, and my favorite was Door Sixteen. In the images you'll notice a couple of dark rooms which I grew to love by reading that blog. Even though my tastes have evolved over the past seven years, I love revisiting photos of this house. We poured our hearts into it, started a family in it, and still drive by it every time we are in Orlando. Here are a few photos from when we sold the house, after extensive renovations. A brand new exterior, two new bathrooms, a new kitchen, with updated plumbing and electrical. Our house was even featured in Better Homes and Gardens' DIY Magazine. Here are some photos my husband took after we bought the house. Before we were done with closing, my parents had already begun to do yardwork. We were so thankful for the help in tackling this big project.